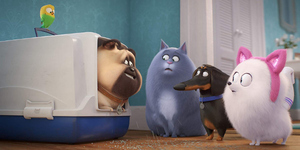 This Chinese New Year celebrates the Year of the Pig, which symbolizes good fortune and prosperity. It also means we’re getting ready to feast on our favorite pork dishes! Whether you want to celebrate this holiday with Chinese cuisine, keep it local with Filipino food, or just use this as an excuse to eat anything pork-related, there are plenty of spots around Metro Manila where you can celebrate this Year of the Pig in the most delicious way possible. Pork buns continue to have their shining moment, with different restaurants from around the world opening in the metro to give Filipinos that ever familiar taste of char siu. 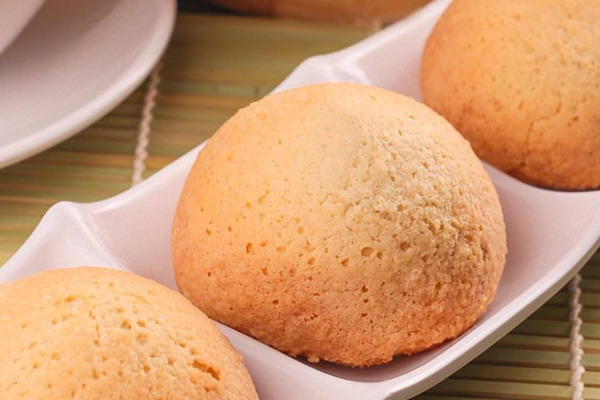 Siopao is pretty much ubiquitous around Metro Manila, which means that a great pork bun is a sure hit. One of the most famous places to get your pork bun fix is at Tim Ho Wan, as the Baked Bun with BBQ Pork (P145/3 pieces) is what the restaurant is known for. They opened their first Philippine branch in 2014, but you can still see long lines on many days, which just goes to show that these buns are worth the wait. If you still haven’t tried these light, flaky buns filled with delicious barbecued pork, you’re missing out! When it comes to Chinese dining, sweet and sour pork is not to be missed, especially in large (and hungry) groups. 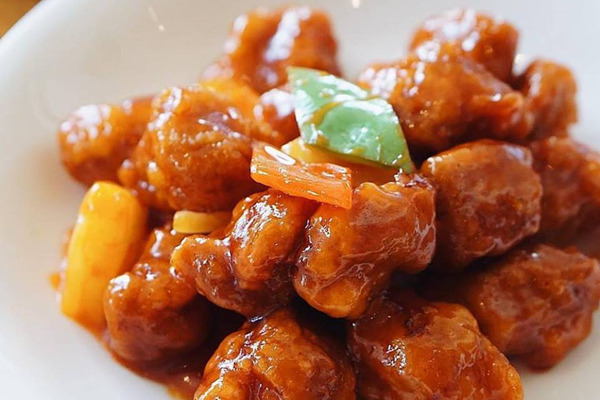 If you find yourself craving this classic dish on Chinese New Year, try Paradise Dynasty’s Crispy Sweet and Sour Pork (P288). This mix of tangy, sweet, and meatiness is perfect to pair with your choice of fried rice, and for the whole table to share. Paradise Dynasty gets the balance of flavors just right, including a variety of vegetables in the dish to complement the tender pork. While you’re at it, you might want to try their legendary 8-flavored xiao long bao, too. It may be Chinese New Year, but it doesn’t mean you can’t celebrate with your favorite Pinoy food! Pork belly is one of the most well-loved cuts of meat when it comes to Filipino food; it can be prepared in several different ways, but having it grilled is definitely one of the best ways to enjoy it. 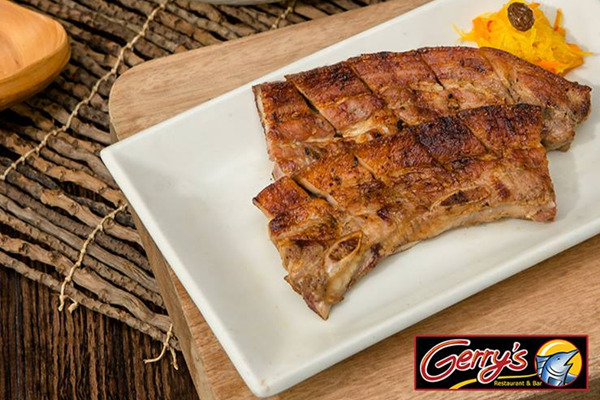 As one of the most well-known restaurants for casual Filipino food and pulutan, you can bet Gerry’s Grill won’t disappoint when it comes to their liempo. The Inihaw na Liempo (P215) is char-grilled to perfection, bringing a sort of smoky taste to the tender pork. Have it with their dipping sauce and a cup or two of rice to really seal the deal. Despite being relatively new in Manila’s restaurant scene, Manam Comfort Filipino has already made a name for themselves as one of the top spots for classic and modern Filipino cuisine. Majority of their dishes come in different serving sizes from small to large, which means it’s perfect whether you’re just on a date, or with the entire family. Their House Crispy Sisig (P140/small, P255/medium, P395/large) is a show-stopper that you’ll crave time and time again once you’ve tried it. It’s served on a sizzling plate, smothered in a savory sauce, and topped with chicharon bits. 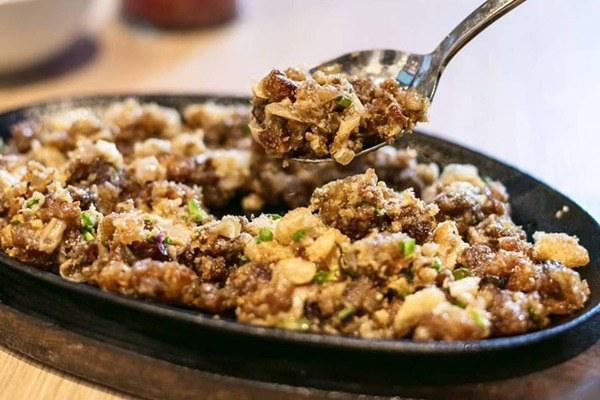 With how addictive and popular this sisig is, the platter will be empty before you know it. If you’re craving Asian flavors, but not necessarily looking for Chinese fare, Japanese may be the way to go! Pork is found in plenty of Japanese dishes – tonkotsu ramen, gyoza, and shogayaki to name a few – but there’s nothing quite like a serving of tender, crispy katsu. When it comes to katsu restaurants, Yabu is one of the first to come to mind for plenty of foodies in the metro. The quality of their food has remained top notch over the years, and even as they introduce more and more items to the menu, their katsu sets with unlimited rice, cabbage, and miso soup will always remain a classic. 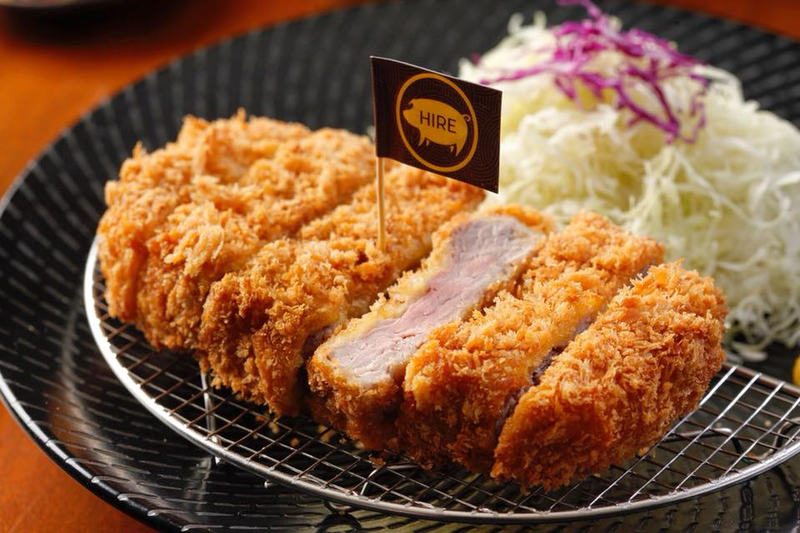 Have the Hire Katsu Set (P370/80g, P400/120 g, P480/180 g), which makes use of a thick, juicy pork tenderloin cutlet, along with the sides to go with it. Don’t forget to grind up some sesame seeds and mix it with their signature dipping sauce! Be ready to get your hands dirty for this next one! 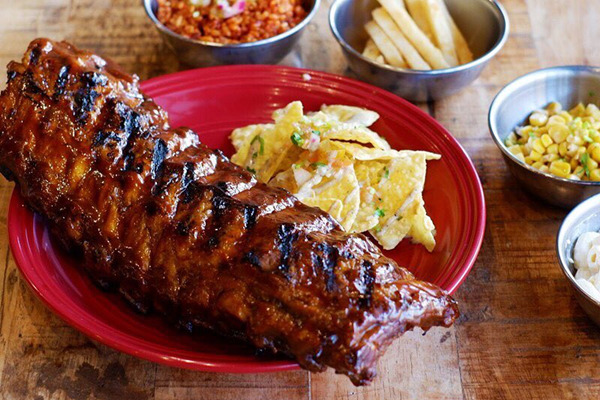 If pork ribs are your thing, you’ll enjoy Latin American and Tex-Mex joint, Gringo, with the tagline “Chicken, Ribs, Friends.” They serve Baby Back Ribs (P325 to P1,099) with a barbecue glaze that’s sweet and sticky but doesn’t overpower the tenderness and flavor of the meat. Help yourself to their variety of side dishes like Mexican rice, smokey beans, and buttered corn, or choose from their healthier sides like roasted squash and even fried saba. You’re in for a treat no matter which ones you choose! Another great way to enjoy pork is in a simple but appetizing taco. Lo de Alberto takes pride in being an authentic taqueria, their space filled with murals and colorful photos that celebrate the culture. Lo de Alberto serves Mexican cuisine that’s all homemade - here, you’ll rediscover your love for tacos, burritos, quesadillas, and more. 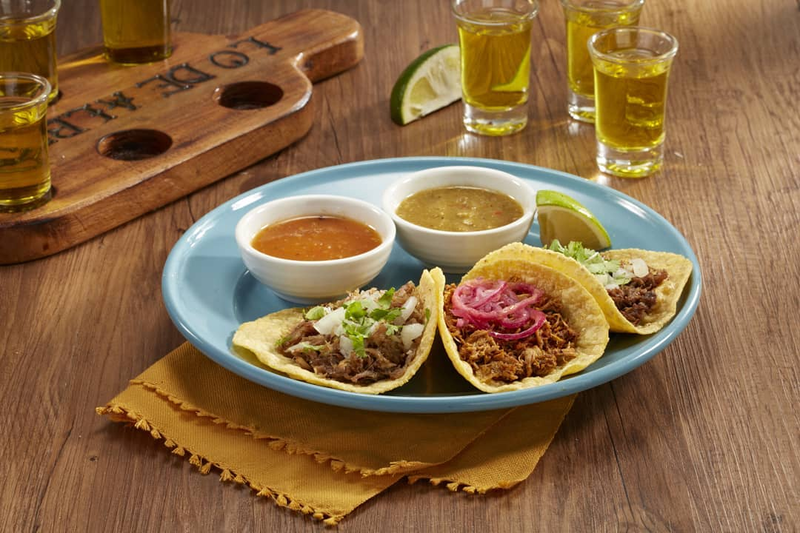 The Carnitas de Puerco Tacos (P195) is made with juicy pork strips and topped with onions and cilantro, all on their homemade soft corn tortilla. The tacos come with a side of tortilla chips and salsa, too. It’s a dish made with minimal ingredients, but its taste and freshness really deliver. How can any group of friends resist the calling of samgyupsal? 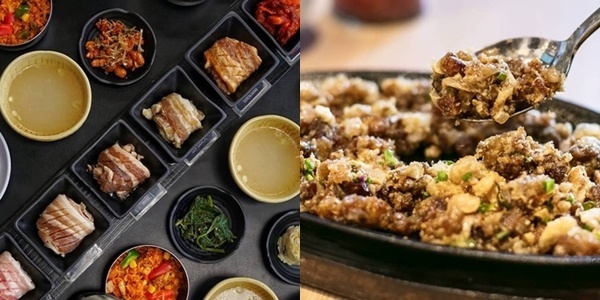 Going to Korean restaurants and grilling up your own meal has become an experience Filipinos look forward to and haven’t gotten tired of just yet. At Soban K-Town Grill, you’ll never get bored since you can try their samgyupsal in six different flavors! 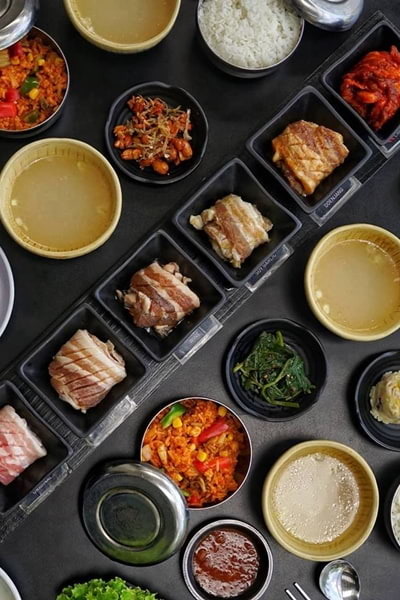 The 6-Flavor Samgyupsal Set (P1,420) is good for 3-4 people, and comes with 540g of pork belly in all their flavors: Original, Fruity, Chili Bean, Soy Garlic, Doenjang, and Wine. It’s also served with unlimited white rice, soup, and side dishes (with an option to upgrade to Kimchi Rice for an additional P20). If you love samgyup but want something a little different from your usual, this might just be your next favorite spot!